"Unto Thee oh Lord I dedicate my service Unto Thee oh Lord in truth I give my worship"
Mother Emma Ruth Daniels was born on October 2,1936, in Pitt County to the late Lizzie Harris and Mark Gorham. Emma was a longtime resident of Winterville. She attended Warren Chapel School and completed a Bible School Certificate program. 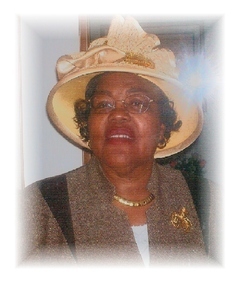 Emma was an active member of Good Hope Free Will Baptist Church serving in many capacities. She served as past President of The Pastor Aide Club, Choir member, President of Mother Board number four, Northwest "A" Conference worker, Young People Christian League member, an avid Sunday school member and participant. Oh grandma! We were so not prepared for your untimely passing. We will forever have you and your wisdom with us to pass on to generations. You will never be forgotten. Love always, your grand baby. Our prayers are with you at this difficult time, may you seek peace through God. The Joyner's from Farmville NC, Kent & Anne Joyner. I am sorry to read about your loss. May God’s words in the Bible at Ps 34:18 provide you comfort. The scriptures tells us “HE” is near to those broken at heart, and those crushed in spirit HE saves. Grandma, Many Years have gone by with you here. Its gonna be tough without your guidance. You taught us many things through faith you taught us the 3 L's LIVE,LOVE,LAUGH you taught us how to forgive the ones who hurt us the most. You shaped us into the strong independent women we are today. Grandma Ruth you will NEVER be forgotten and most importantly your love will ALWAYS be cherished. Grandma, Many Years have gone by with you here. Its gonna be tough without your guidance. You taught us many things through faith you taught us the 3 L's LIVE,LOVE,LAUGH you taught us how to forgive the ones who hurt us the most. You shaped us into the strong independent women we are today. Grandma Ruth you will NEVER be forgotten and most importantly, your love will ALWAYS be cherished. You're not here any longer, but your memories still remain captured in my heart. You are my angel and rock that was created to made my life what it is, and now that you are in heaven, I know you will forever watch over Chynna and me. Grandma Ruth I love you and will forever miss you and I know you are saying "Baby don't cry for me rejoice" I will in time but for right now I can't stop crying for my Icon my Queen. May God, in His infinite wisdom, grant you peace; and may His Holy Spirit comfort you during your time of sorrow. My sincere condolences on the loss of your dear mother. He has made everything appropriate in its time. He has also set eternity in their heart, yet so that man will not find out the work which God has done from the beginning even to the end. I know that there is nothing better for them than to rejoice and to do good in one's lifetime. -Ecclesiastes 3:11-12.. I believe in my heart that I will see you again. Our prayers and thoughts will be with you all during this time of sorrow yet a time of celebration, much love from all of us to all of you, to the Daniels Family. I just heard today about the passing of your mother. I just want you to know that I am thinking about you and that you and your family are in my prayers. Keep the faith and know that God will comfort you. Your Mom is resting in peacefully in God's arrms. HOPE AND HONOR CROSS STANDING EASEL was sent by Ray and family. SPATHIPHYLLUM was sent by Gladys Atkinson. To the family...we the Cox family feel your lost. Ruth was not only a church member but a part of our family. We loved her very much. Our prayers and thoughts are with you during this time and thereafter. Continue to look to GOD for your strength and He will supply your every needs. I was blessed to have called you Grandma Ruth. You showed me unconditional love and for that I am forever grateful. I appreciate the legacy that you leave behind and the endless prayers you prayed for me. I know without a shadow of a doubt that I had a praying Grandmother. Though distance kept us apart, my heart always rejoiced at the mention of your name or the sound of your voice. I thank God for allowing me to have had you, Grandma Ruth as my praying Grandmother. I will always love you forever and a day. SPATHIPHYLLUM was sent by Wanda Phillips. On behalf of Bishop Charlie J. Smith and the Holy Ghost Deliverance #3 Tabernacle of Hamden Connecticut, please accept our most sincerest condolence to the family of Mother Daniels. Mother Emma was a wonderful and loving person. Her smiling face and warm sense of humor will be dearly missed. We pray that God grant the family Grace and Mercy during your hour of bereavement. SHADES OF ELEGANCE was sent by The Ruiz Family, Mike, Juanita and Gabriel. You have been a blessing to so many of us and for that we are lucky to have known you for our lives are better because of you. You shine bright even on a rainy day. Our lives may change but our memories of you will always remain the same. To your family, no words can really help ease the loss you bear, just know that you are very close in every thought and prayer. To the Daniels and Phillips family, you have my deepest sympathy in the lost of your dear Wife and mother. I will pray your strength in the lord. My prayers will be for you. Remember when you are pressed down to your knees, seize that moment to talk to our heavenly Father. May God be with each of you during this time of bereavement.